This audio program will lift you up IMMEDIATLEY into a world of Fun, Laughter and Abundance. Laughter helps build up your immune system, creates a higher vibration and literally will take you from depression and negative thinking into instant positive feelings. After listening to this CD, you will wonder what you were even worrying about. When you are in a higher vibration, you will attract more good in your life and everything will look brighter. 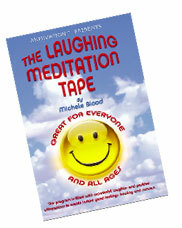 Michele created this CD filled with wonderful laughter and affirmations to create instant good feelings and healing. If your team at work or family members are feeling low energy or stress, put this tape on and see the immediate change in attitude as laughter and joy permeates the atmosphere. Every person will be lifted into joy and positivity. It is also HIGHLY recommended that you play this tape for ANYONE who is ill, depressed or in the hospital. Use this tape every day for maximum results and FUN! Great for everyone and all ages.